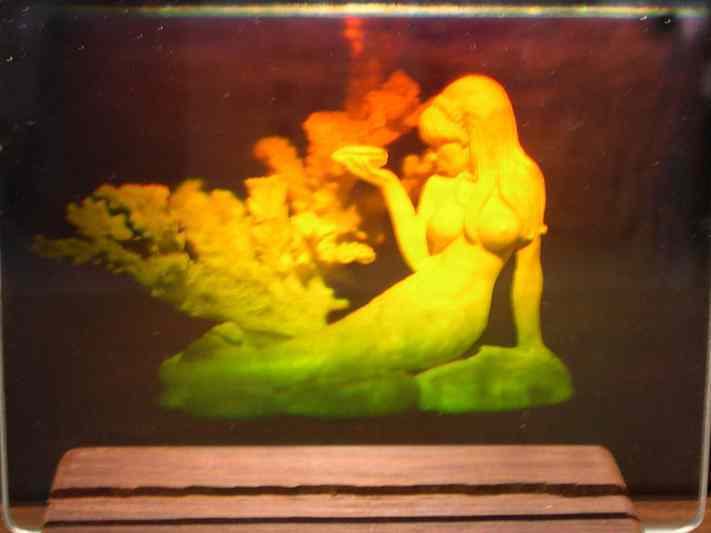 Just a quick note: after the sudden but not totally unexpected demise of the refence forum in holography, www.holographyforum.org, (see here the explanation of this proccess), a new forum seems to try to get its place, and hopefully will, if egos allow. The new forum is www.holoforum.org and Ahmet deserves a big THANKS for putting it up. Best luck with this new adventure! At the time some long time contributors to the old forum are registered there. I also want to thank Colin (Kaminski) for his constant effort over the last few years, first setting up the original Network54 forum, then the holographyforum, then the holowiki… and constantly kindly answer all questions from newcomers, spending lots of time on us. I finally got around to refurbishing my CNC machine and set it to work for real! This is not the place to discuss the project I am working on, but let me say it is what the CNC machine was created for originally… and the machine seems to behave even better than expected. My CNC Refurbished and ready to work! – I traded speed for precission: I got motors with too small a step and leadscrews with too small a pitch for my needs – I should have been more serious about my needs, I just jumped looking for precission while I did not need that much, and gave speed for granted! A coarser set-up (less steps per turn in the motor and a longer pitch in the screw) would have served my needs regarding accuracy and would have granted me much higher speed. At the moment, I have to stick to this set-up, since changing any of those elements would be too expensive. Too bad. Lesson 1: Think about REAL needs first! – Now, the solution provided in the forum was great, but I should have been able to get there myself… Lesson 2: Try, and keep trying new things! 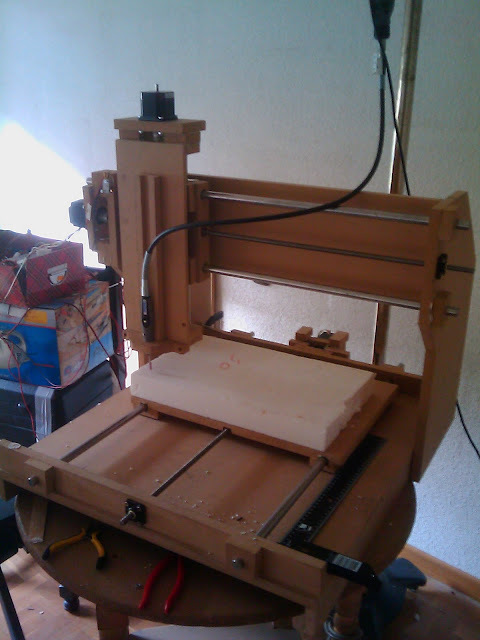 Well, this is what I did… my CNC machine… It has a cutting area of A3 times 10 cm in depth. The only drawbacks are that it is very noisy, produces lots of dust and it is really sloooooow…. So I am in the process of upgrading it with a holding case to reduce noise and dust and with new threaded rods that are supported on both ends, not just at the motor end as they were. Eduard Punset states that the overwhelming availability of choices present in modern life is a hell of a stress factor and an important cause of unhappiness. Man, he is right! At the beginning of the DIY-Cintiq (I should really get a name for mine! ), many choices need to be made, and they are difficult to deal with at times: I found a great offer on ebay for a wacom table, but quite a large one: 12”x18” for 50€ total, and I could not refuse it (I know there are far more offers in the US, but post and customs costs to Spain cause you to lose any possible gain). Also I got a very cheap compaq 15” monitor with external power supply for 40€… I got it because it is the only one I could find at surplus dealers with external power supply. Build with what I have: I would have half the tablet for the monitor, and the other half to map to the main screen… it seems nice, but maybe too big an not very practical. Also I need to check the jittering compatibility of these two ! So, who many times you think, “oh, it would be great if I could build a […], wouldn’t it?”. Just go and google it, chances are someone has already thought about it, and yes, surely built it too, and even have a nice forum set up full of wonderful people willing to share and help. The thing is a beauty, but just a bit pricey for just a whim… maybe Art & Design pros can afford it, but not me! I will do the googling for you, and the site to go is definitely Drew’s DIY Cinqit page… and his forums. Anyway, isn’t it too much of an effort just to get a tablet PC?… not quite, since Wacoms are much more functional than just a mere tablet: they are pressure sensitive among other wonders… In any case, it is a little overkill if you are not a pro in Arts… hell, I don’t even draw!… but you know what?, it seems so much fun to build one, and I am sure it makes a great present for someone who works in arts. So, here I go!… this is not a project for the faint hearted, though: we will be seeing the guts and most likely corpses of LCD monitors, pen tablets and the like… take out your weapons (let’s say s screwdriver and soldering iron) and let the game begin! As stated in the about post, I will be including info on different projects I have been doing and hope to keep doing in the next months. First one I want to include is a DIY CNC machine built from plans purchased from Rockcliff… here I post two videos of the first cuts… The model is scaled up from the original plans, which has caused some problems: the threaded rods that drive the motion are not supported in one of their ends, and this makes the rods bend a vibrate too much, so at this moment the machine is torn to pieces to upgrade it with supported rods, which will hopefully allow me to increase both, stability and speed. I am also planning on builing some kind of isolaion enclosure to reduce dust and noise, which are a no-no when you don’t have a workshop and use an spare room in your downtown flat.